Rabbi Daniel Bar-Nahum is very excited to have joined the family at Temple B’nai Torah in July 2018 after its merger with Temple Emanu-El of East Meadow. He looks forward to maintaining traditions while at the same time helping to move the congregation and community in new and exciting directions in worship, learning, and communal engagement. 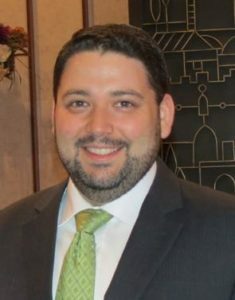 Rabbi Bar-Nahum joined Temple Emanu-El of East Meadow in 2012 as Associate Rabbi/Education Director and continued to oversee the Religious School while assuming the pulpit as of 2013. He was Ordained in 2012 by the Hebrew Union College – Jewish Institute of Religion in New York, completing a Rabbinic Thesis on Talmudic notions of action, intention, and voice. Rabbi Bar-Nahum earned a Masters of Arts in Hebrew Literature from HUC-JIR in 2011, and also holds a Master’s in Jewish Education, earned in part by researching Jewish identity formation in teenagers. He earned a Bachelor of Arts in French and European Studies from Vanderbilt University. He is a member of the Central Conference of American Rabbis, and the Long Island Board of Rabbis. Rabbi Bar-Nahum enjoys spending time with his family, travel, cooking, and rooting for the Cubs.